(MoneyWatch) Thousands of Americans are sent to jail not for committing a crime, but because they can't afford to pay for traffic tickets, medical bills and court fees. If that sounds like a debtors' prison, a legal relic which was abolished in this country in the 1830s, that's because it is. And courts and judges in states across the land are violating the Constitution by incarcerating people for being unable to pay such debts. Ask Jack Dawley, 55, an unemployed man in Ohio who between 2007 and 2012 spent a total of 16 days in jail in a Huron County lock-up for failing to pay roughly $1,500 in legal fines he'd incurred in the 1990s. The fines stemmed from Dawley's convictions for driving under the influence and other offenses. After his release from a Wisconsin correctional facility, Dawley, who admits he had struggled with drugs and alcohol, got clean. But if he put his substance problems behind him, Dawley's couldn't outrun his debts. Struggling to find a job and dealing with the effects of a back injury, he fell behind on repayments to the municipal court in Norwalk, Ohio. He was arrested six years ago and sent to jail for not paying his original court fines. Although Dawley was put on a monthly payment plan, during his latest stint behind bars in 2012 the court ordered him to pay off his entire remaining debt.
" I called my brother, and they told him I have to pay off the whole fine in order for me to get out," he said. "That was $900. So I sat my whole 10 days [in jail.]" Such stories are by no means unusual. Rather, they reflect a justice system that in effect criminalizes poverty. "It's a growing problem nationally, particularly because of the economic crisis," said Inimai Chettiar, director of the justice program at New York University School of Law's Brennan Center for Justice. Roughly a third of U.S. states today jail people for not paying off their debts, from court-related fines and fees to credit card and car loans, according to the American Civil Liberties Union. Such practices contravene a 1983 United States Supreme Court ruling that they violate the Constitutions's Equal Protection Clause. Some states apply "poverty penalties," such as late fees, payment plan fees and interest, when people are unable to pay all their debts at once. Alabama charges a 30 percent collection fee, for instance, while Florida allows private debt collectors to add a 40 percent surcharge on the original debt. Some Florida counties also use so-called collection courts, where debtors can be jailed but have no right to a public defender. In North Carolina, people are charged for using a public defender, so poor defendants who can't afford such costs may be forced to forgo legal counsel. The high rates of unemployment and government fiscal shortfalls that followed the housing crash have increased the use of debtors' prisons, as states look for ways to replenish their coffers. Said Chettiar, "It's like drawing blood from a stone. States are trying to increase their revenue on the backs of the poor." In Dawley's home state of Ohio, the local chapter of the ACLU announced today that it had found conclusive evidence of such polices in 7 of 11 counties in the state that it examined over the course of a year-long investigation. 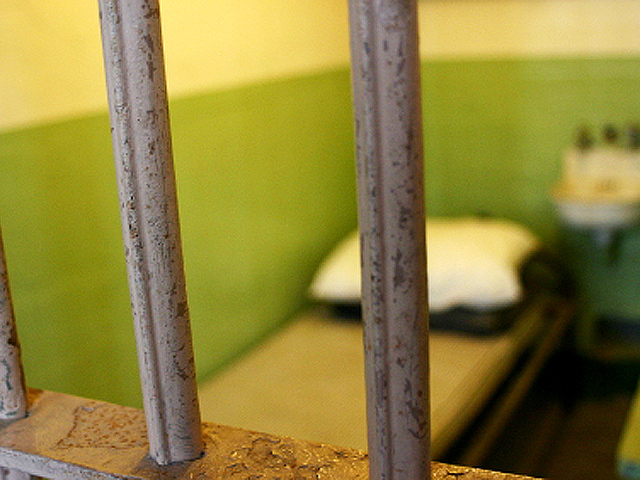 Although debtors' prisons are unconstitutional and prohibited by Ohio law, poor defendants are routinely jailed for failing to pay court fines, the group said in a report. Municipal and so-called mayors' courts -- Ohio is one of two states in the U.S. where mayors can administer the law, even if they aren't licensed attorneys -- also commonly do not give defendants like Dawley a hearing or inform them of their rights to counsel, as required by law. "They didn't give you the opportunity to say you couldn't pay," Dawley said of his time in court. "They just gave out 10 day sentences.... There was nothing about your finances. Either you plead guilty, not guilty or no contest. They give you a jail date and put you on a payment plan, and if you don't make the payment plan you're going to jail." In so doing, courts fail to make a crucial distinction between defendants who have the means to pay their debts but refuse to do so, and those who are too poor to repay. That failure derives in large part from the lack of a consistent legal standard for determining willful nonpayment of such debts. As a result, while a judge in one state may take into account that a person on food stamps is financially unable to pay court costs, a judge across the state line might sentence that same individual to 10 days in the clink. "If you don't have resources for an attorney or can't afford other fees associated with court, you get a different brand of justice," said Mike Brickner, director of communications and public policy at the ACLU of Ohio, noting that such practices are "rampant" in the state. "And with the economic downturn over the last 10 years, we've seen an increase and resurgence in debtors' prisons." In another case the group uncovered in Ohio, a mother of three was imprisoned for 10 days for failing to pay $540 in fines and costs related to a conviction for driving with a suspended license. And as in other cases where the indigent are jailed, taxpayers ended up footing part of the bill. The total cost of arresting and incarcerating her amounted to nearly $1,000. The final tab for the county? A loss of some $930, ACLU of Ohio found. "If someone who can't pay is incarcerated, it ends up costing the state more because it costs more to put them in prison than what they originally owed," Chettiar said. Jail time can also accelerate a downward spiral for the debtor, because additional court costs are piled on top of their previous debts. That makes repayment even harder, and the cycle continues. Some cities, meanwhile, have joined states in reviving the use of debtors' prisons. Philadelphia courts in 2011 sought to collect on court-related debt from 320,000 people, involving obligations they owed dating back to the 1970s. But some judges have had enough. An Alabama circuit court judge last year rebuked a municipal court and private probation company for incarcerating people over their criminal justice debt, calling the arrangement a "judicially sanctioned extortion racket." Yet such critiques are insufficient to finally lock the gates on debtors' prisons, according to experts. Perhaps most important, poor defendants should be exempt from court fees and fines, while repayment plans should be set according to people's ability to repay a debt, the Brennan Center said in a recent report. States also must have clear written standards for determining a person's ability to pay. Fees for public defenders should be eliminated. As for Dawley, who said the local court has relented in recent months in locking up people like him as public scrutiny of the issue has grown, he doesn't expect to return to jail. He is now looking for a job. "I'd like to get some retail work," he said.